Photo: Pollock-Capps House, ca. 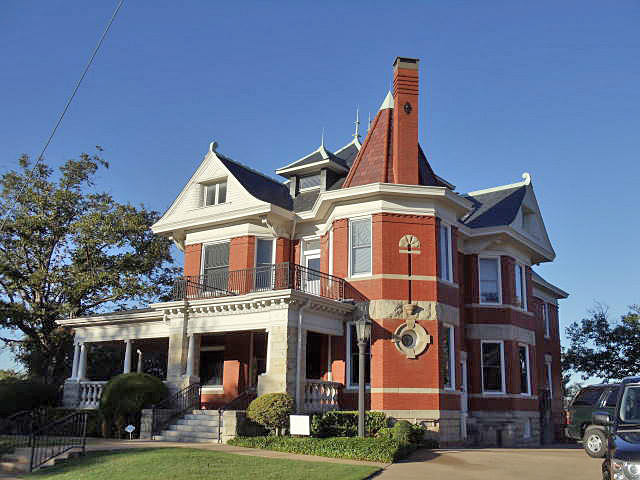 1898, 1120 Penn Street, Fort Worth, TX. Listed on the National Register of Historic Places in 1972. Photograph by user:Renelibrary, 2011, (own work) [cc-by-3.0 (http://creativecommons.org/licenses/by/3.0)], via Wikimedia Commons, accessed October, 2012. Fort Worth is on the Trinity River in the north central part of Texas. It is as thoroughly representative of the Southwest as a long-horned street. Its metropolitan aspects — towering business buildings, noisy traffic — vividly exemplify the modern city; but its people typify the spirit and atmosphere of the Old West. More than 80 percent of Fort Worth's population is native American. Many of them are descendants of the wiry pioneers of the plains country. Yet for all its speed and activity, Fort Worth is one of the State's most hospitable cities. There is still time for a cordial "Howdy stranger," and a nice disregard of the city's uproar in the easy pause for conversation that is definitely reminiscent of the top rail of a corral fence, with boot heels hooked for balance and plenty of time for talk. Rather oddly, Fort Worth was never a fort. Originally it was a camp where, in 1849, Brevet Major R. A. Arnold and a troop of dragoons kept a watchful eye on the Indians. The camp was named Fort Worth in honor of General William Jenkins Worth, Mexican War hero. After the Civil War, when the cattle drives trailed up through the little community, it became an important trading and supply center. By 1866 educational facilities were urgently needed, so its citizens bought a wagonload of flour which they traded for lumber, to convert the Masonic Hall into a school building. In 1870, when it became apparent that a railroad might soon reach the settlement, Fort Worth enjoyed rapid growth. It was incorporated in 1873. That same year, with the railroad as near as Eagle Ford, 26 miles distant, land values boomed and the population was more than 5,000. Then came the "Panic of '73," with the failure of Jay Cooke & Company, which held most of the liens against the new railroad, the Texas and Pacific, and also against much of the property in Fort Worth. That blow immediately shifted the weak-hearted from the community. A majority of the new residents headed east and the population fell below 1,000. During the hegira a young lawyer wrote a letter to the Dallas Herald asserting that Fort Worth was so dead he had seen a panther lying asleep and unmolested in the main street. The thousand stalwarts who remained greeted that calumny with hoots of derision. The fire department bought a panther cub for a mascot. Local clubs attached the name "panther" to their former titles, and the "Panther City" was born. The Panthers sharpened their claws. They wanted a railroad, and a railroad they would have if, as a local resident declared, "every bank and peanut stand in the entire East failed." They offered to grade the remaining 26 miles of unfinished roadbed in exchange for a lien on the road. The Texas and Pacific agreed and the Panthers set out to help complete the moribund railway before the land grant subsidy given by the legislature should expire. In 1876 the situation developed into a race against time. The road had to be completed before the legislature adjourned—and adjournment day was near. Meanwhile, Fort Worth scratched gravel. Every business house operated with the barest minimum of workers and sent the bulk of its men to the railroad right-of-way to wield pick and shovel. The women of the city worked in relays, preparing hot coffee and food, and feeding and watering the mules. The legislature remained in session until the road was completed, and on July 19, 1876, the first train into Fort Worth stopped at what is now Boaz Street and Lancaster Avenue, its whistle cord tied down and the editor of the local newspaper frantically shoving fuel into the firebox to keep the steam whistle going. That was the beginning of the city's present network of nine trunk line railroads. During the construction of its first rail line, and for some time thereafter, Fort Worth was a typical frontier town. Gamblers, cattlemen, and all types of characters familiar to the Old West thronged the city. A bit of unusual excitement was provided when the Comanche chiefs, Yellow Bear and Quanah Parker, the latter famous for his raids against the whites, visited town and went to bed after blowing out the gas. Yellow bear never awakened, but Quanah Parker recovered and lived to become a friend of his former enemies. By 1875 citizens of Fort Worth had sensed the value of capitalizing the city's strategic location as the market place of a great southwestern empire of cattle and cattlemen. They organized a meat packing company and built the first stockyards in Fort Worth. A quarter century later, Swift & Company, Armour & Company, and Libby, McNeill & Libby entered the field, and by 1902 those companies had completed a group of packing houses in Niles City, then on the outskirts of Fort Worth. Their presence attracted allied industries, and during the decade that followed, the population jumped from 26,699 to 73,312. The World War wrote a new chapter in the story of Fort Worth, with the establishment of Camp Bowie within the city and of several flying fields in its immediate vicinity. Little remains of any of the military camps and fields, the site of Camp Bowie now being virtually filled with residences. Oil was discovered in 1912 at Burkburnett, 125 miles northward, and immediately after the World War, the Ranger field, 100 miles westward, was brought in.